Ceramics is a mod designed to increase options early game using clay. Inspired by the clay bucket from Iguana Tinker Tweaks. 12 Nov 2017 - Added downloads for MC 1.12.2 version. This adds rainbow bricks and clay. 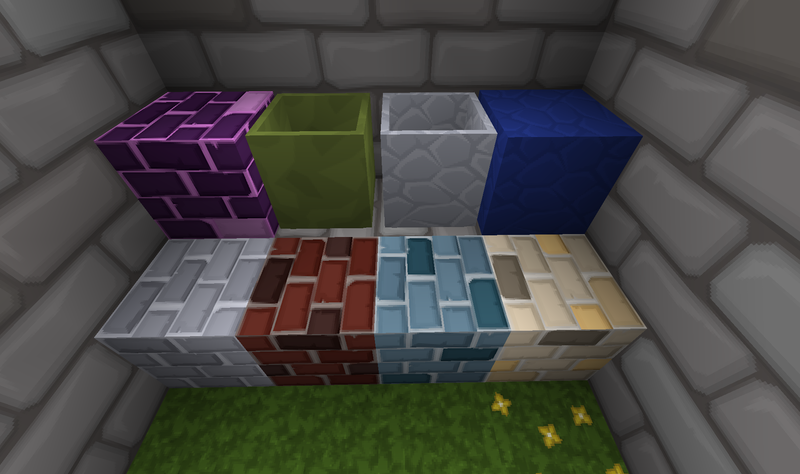 Textures for the channels and lava bricks. Last edited by Novamanga on 05 Feb 2019, 10:27, edited 2 times in total. I really like this mod for the brickwork and stacking wells but I noted some texture issue when the well get stacked up (a clear band of 1 pixel, not sure texture or its the mod). This be in 1.11.2 but I am updating to 1.12.2 once a few more Resources update. This be one, so the annoying typical question. There an update in progress for 1.12++ or 1.11.2 work ok? Just checked the 1.11 textures and there are no missing pixel lines so it must be the mod. Also released the 1.12.2 version. I still play MC 1.12.2 and this mod and noticed a new block the monochrome! Guessing that was newest update but there is no texture for the block sets. Possible update? I can't do the art the justice in making my own version as I am sadly learning on another (taking me forever to do it).